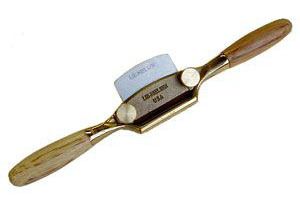 Many of us have a picture of a certain spokeshave in the back of our mind. You know the one I’m talking about. Somewhat beat up with a mouth that’s open so wide you’d swear it was a big mouth Bass. I personally own two old second-hand shaves that so exemplify this statement. I can get lucky, on occasion, and get a decent cut without the grain tearing out, but it’s not a tool in which I’ve had a lot of faith. Now cue the cameras to zoom in on the Lie-Nielsen/Brian Boggs collaboration of shaves; specifically, the curved bottom shave. It has decent mass (12 oz), nice Hickory handles, and a to-die-for tight mouth. The sole on this shave has a 5” radius, which provides access to inside curves. You can modify it if you need to work curves with a tighter radius, within reason. Setting up the shave is very easy. The first thing to remember is a sharp tool is a must. Even though the iron is somewhat sharp from our factory, it should be honed to 8000 grit. The iron comes with a bevel of 25 degrees and the honing is done with a five degree micro bevel, raising the angle to 30 degrees. Since the iron is very short, the honing can be accomplished by holding the iron by hand, or with any of the honing guides geared towards short irons. If you aren’t comfortable with sharpening, you can read one of my previous articles on this blog where I focus on that skill. With a sharp iron, set the shave sole down, so the mouth is on a flat surface. Slightly loosen the thumbscrews, until the iron can move forward to the point of touching the flat surface you are using. Snug up the thumbscrews, and test the cut. This should provide a thin shaving, but it is easy to adjust from this point if it doesn’t. To advance the iron, you can either use light taps with a light weight hammer, or while holding the shave with the mouth facing down, hold one handle and tap the other on a firm surface. If the shaving is too thick, flip the shave over so the mouth is facing towards the ceiling and again, holding one handle, tap the other handle on a firm surface. If the iron doesn’t want to move, very slightly loosen the thumbscrews. If you loosen them too much, the iron will advance/retract in movements larger than optimal. Remember to again snug the thumbscrews down if you made any changes. With these techniques, it is very easy to make small adjustments. One last adjustment is completely optional, but a good idea. When you are setting your depth of cut, a slight skew in the iron will allow a heavier cut on one side and a lighter cut on the other (e.g. left side heavy and right side light, or vice versa). With this, you can remove material quickly on one side, then follow up with a finishing cut on the other side, without going back to change the setup. This certainly helps save time. Now that the shave is set up, usage is similar to many wood cutting tools. The wood grain will dictate the direction that cuts the cleanest. I find that holding the wood I’m working, in a vise or shave horse, allows me to use both hands on the shave which provides greater control. I’ve seen some folks use the shave by holding the wood in one hand and the shave in the other. For me, this is a recipe for disaster, whether it be a poor surface or possible injury. Just remember that a shave is a finesse tool, and with that, small changes in pressure will make a difference in your results. Find the wood holding device that works best for you, and start making some shavings. I hope to see some of you at our upcoming events, listed on the Lie-Nielsen website. Stop by and say hi. I just bought two of these. One round and one flat bottom. Minimal setup, just hone and use. I immediately got a whisper thin shave and showed no signs of tear out even on difficult grain. My other spokeshaves are worthless by comparison. Thanks for the comment, Erik – We’re so glad to hear you are enjoying using your new spokeshaves!